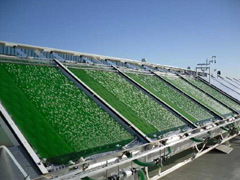 On the market of alternative fuels helioculture is a major breakthrough. It is scalable and inexpensive, and it could help reduce a large amount of water wastage in certain areas. It is even possible to grow the microorganisms in waste water and salt water. The fuel that will come from this process is cheaper than gasoline, and will cost around $50 per barrel. This is a good bargain, since oil prices are currently nearing $70 per barrel. By 2022, it is aimed to have 36 billion gallons of this alternative fuel to be blended with the gasoline supply. This is another one of the extreme new alternative energy sources, which will involve sunlight and greenhouse gases. Microorganisms are at the center of the process, which will secrete a chemical similar to ethanol when exposed to the sun and CO2. The resulting fuel would be perfect for running a vehicle, for example. SolarConverters, which are flat large panels, will be used to cultivate this reaction. There is already a commercial-scale operation underway that will be producing 20,000 gallons of oil on every acre annually. Posted on June 6th under Bio Fuel Production.